Last year was our first time celebrating Halloween since moving to Dublin and we had a memorable holiday! One of our favourite places to visit was Scalp Wood Nurseries in Kilternan. Scalp Wood is a retail nursery and garden centre specializing in home-grown plants and shrubs, with a team that loves to celebrate Halloween! 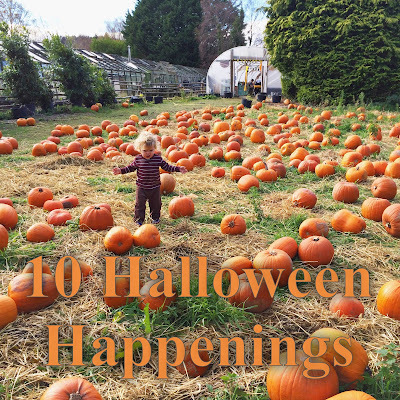 With several activities on, including a hay bale maze, a spooky themed witches room, and a faux cemetary, it's easy to get into the SPIRIT here. There is a duck water race created from gutters and an old water pump that the kids played with over and over. And if you're looking for that perfect Instagram worthy photo, there are plenty of opportunities here, including one with Spookley, the square pumpkin. Farmer Joe is a real TREAT too, offering sweets to the kids and encouraging them to explore the premise. Which duck will win the race? The main attraction is the Poly-tunnel that's been converted from an ordinary plant growing structure to a Halloween themed event space. Inside the tunnel you'll find lots of tables & benches for kids to decorate their pumpkins, there's chalk boards to draw on and colouring pages to fill in. Walk through the tunnel where you'll discover a pumpkin patch with plenty of choices for your Jack-o-lantern. Scalp Wood has staff on hand to carve your pumpkin too, so you can leave the nursery with all the hard work done for you! And from the sounds of Scalp Woods' recent Facebook updates, 2015's event promises to be even better than before! With a very reasonable entrance fee ( €5 covers a family of up to 4 people), your group gets access to all the activities. It appears there will be an opportunity to purchase ice cream and sweet treats from Enniskerry's Sugar & Ice mobile unit too this year. One tip from our family is don't be TRICKED by the weather, be sure to wear your wellies and be prepared to get a little dirty! We'll be heading back to Scalp Wood again this weekend, and we plan to make time for visiting Meath Pumpkin and Wooly Ward Farm soon too. We are all looking forward to another fun-filled Halloween and with so many happenings in and around Dublin leading up to the occasion, here's a list of 10 family friendly activities that sound like great fun! I really hope you can CARVE out some time to make a trip to any of these activities! Please let me know in the comments section below if you stop by any of these places and what did you think?! Happy Halloween, friends! Updates: We visited Scalp Wood on Sunday, October 18th and it was another fantastic event, with a bigger hay maze and lots of pumpkins to choose from! Check out Pies & Gents Facebook page for the 2015 photographs! Dun Laoghaire Rathdown events team put on a superb show with the haunted Samhain walk. It was quite a spectacle, with everything from a butcher's shop, an electrocution, dragons, graveyards, chain-saw wielding mad men and a giant spider about to attack! With two young children we went for the earliest time slot at 330pm, but it was still dark as we were strolling the wooded trail. A well organized, free event! Wooly Ward's Farm impressed us with a great afternoon out on the 24th. Included in the admission price was a pumpkin to carve there, a petting shed & separate reptile area, train rides through the field, chocolate covered apples to decorate, a massive Fuinneamh drum session, bouncy castle, spooky trails, fairy wood, a funny interactive theatre show and much more! Great spot for a family day out! These hoots are great, the kids are always having so much fun! They are really into Halloween this year! It's so much fun to see!